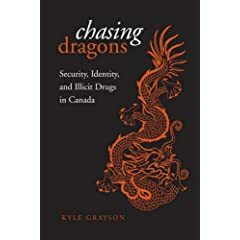 Our book of the month for March is Chasing Dragons by Kyle Grayson. The book is listed in our extensive library of relevant and interesting titles and as ever we are grateful to our book reviewer David Hart who has written the following . From Chinese opium smokers at the start of the 20th century to Somalian khat chewers at its end, Canada has long been home to groups of people whose drug use has led them to be defined as a security threat, and who have been subject to repressive measures by the state. This book sets out to show how the way drug users have been portrayed in Canada has always been contingent on who has been regarded as speaking the truth about drugs, how Canadians have wished to see themselves, and how they have sought to position themselves relative to other countries, particularly the USA. A central theme in the book is the tension between the degree to which Canadian authorities are prepared to use repressive measures against drug users and the country's self-image as a liberal, progressive state sharing a border with a punitive, conservative one. It will be a surprise to some readers to learn that Canada was at the forefront of prohibitionist lawmaking in the early 20th century, and that less has changed since than many Canadians would like to believe. Several subject areas are discussed in the light of this: the popular perception of the relationship between drug use and race, which in the early part of the 20th century was overtly racist in seeing ethnic minorities as a threat to the morals and health of white Canadians, now manifests itself as a sort of cultural racism, whereby Canada cannot claim to be an inclusive multicultural society if it persecutes ethnic minorities simply because they are ethnic minorities, but it can and does limit its inclusiveness non-politically threatening cultural practices such as cuisine, music and dance, while still portraying, say, Somalian-Canadians who abstain from using khat as more enlightened, or at least more welcome in Canada, than those who continue to use it despite it's contraband status. The process leading up to the decriminalisation of cannabis for medical purposes is also discussed, and again there is a discrepancy between the degree to which Canadians can claim to be living in a more liberal society than the USA after Canada's federal government was forced by the courts to introduce its Marihuana Medical Access Regulations in 2001, and the fact that it remains very difficult for patients to actually receive medicinal cannabis, and the state still pursues a punitive approach to non-medical use. There is also an informative chapter on Canada's rave culture which sprung up in the 1990s and soon found itself demonised by law enforcement representatives for condoning MDMA use, and compelled to organise itself politically in defence. Again, the end result is a situation that looks more liberal on paper than on the ground; while a code of conduct for rave venues was created, so much power was left in the hands of the police in determining how many officers to assign to an event (and charge the organisers for) that the law enforcement community is effectively able to make legal raves economically unviable.All the while, the book seeks to demonstrate how the policy options that could legitimately be debated regarding drug use have been constrained by the public attitudes about drug users. Unfortunately, much of the early part of the book is phrased in the densely structured, obscure-word-laden language of the post-modernists, making it difficult to follow the sentence structure, let alone the argument. I'm sure it could have been expressed concisely and clearly, but probably the author is just following the fashion in academic circles, rather than willfully seeking to obscure the message. At any rate, once we hit chapter 4 the text becomes comprehensible, so don't be put off; this is a book that has a worthwhile contribution to make to the study of how defining behaviour or persons as a security issue shapes the very way a country can define itself.